The reputations of companies are multi-faceted. From the public moniker “People of Wal-Mart,” to customer approval ratings, one thing Wal-Mart® excels in is their supply chain. The consistency of their prices and carried inventory across 5,000 U.S. stores and 1.3 million workers would be impossible without the best in supply chain management. The “invisible” logistical and best practices part of Wal-Mart’s business produce a worthy benchmark to survey and mimic as a supply chain manager. 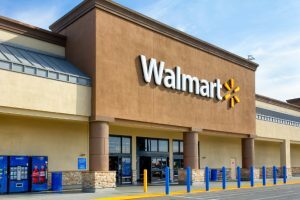 Wal-Mart Stores Inc. is one of a growing number of big-box retailers building out their supply chains with distribution centers designed to meet the demands of online shopping. The company expects to open four such giant facilities this quarter, as it aims to triple online sales by 2018, to $35 billion from $12 billion last year. Wal-Mart, the world’s largest corporation, is fresh out with its 2015 sustainability report, the eighth such document it has produced. The 2015 document is quite remarkable, with Wal-Mart more aggressively than ever redefining its corporate mission from delivering quality products at everyday low prices to making the world itself a better place, in almost missionary terms. They go on to quote Wal-Mart® on how true-cost of products are taking priority to secure the lowest true cost for all areas of the supply chain and buyers as well as Wal-Mart’s stated initiatives for retail employee development and overall improvements. Wal-Mart® grossed $476 billion in 2014 with significant gains beyond 2010’s $408 billion, per The Wall Street Journal’s MarketWatch. In perspective, they made about the same as 81% of total U.S. restaurant industry 2013 earnings. The 4,100 stores produced that income, ranking them 14th for 2014 by Gartner research and analyst company. Wal-Mart® has been in Gartner’s top 20 supply chains since 2010. In 2014 rankings, Gartner called Wal-Mart® a “perennial supply chain powerhouse” and the National Retail Federation ranks them the world’s top retailer in global sales with a “mature supplier collaboration process” supported by technology. Wal-Mart’s mammoth purchasing power is leveraged to shape suppliers’ behavior to drive down costs, Gartner said. In 2012, Arkansas Business listed three things that have evolved Wal-Mart’s supply chain success: distribution practices, operating its own fleet of trucks, and technology for improvements in efficiency, inventory management and product forecasting. In the 1980s, Wal-Mart® began directly dealing with manufacturers, giving suppliers the job of managing inventory in its warehouses, per Arkansas Business. The result, vendor managed inventory, or VMI, reduces flow of inventory problems and ascertains units are always in stock. By ensuring cooperation plus collaboration for their suppliers, Wal-Mart® created an efficient and effective supply chain connected by technology. The forward-thinking company predated VMI in 1975 by employing computer system inventory control in all its warehouses and distribution centers per Supply Chain Digest’s timeline of Wal-Mart® history. Point-of-sale information, current sales and inventory by warehouse inventory are now managed by a centralized database and data is share with suppliers so they are apprised of unit shortfalls and empowered to immediately and proactively ship out additional units. In 1987, the company’s satellite system for voice and data information empowered sharing within all company segments of the company per CIO Online, a CIO website. In 1989, distribution costs registered as 1.7% of total sales, roughly lower than 50% of Kmart’s reported costs and slightly less than one-third of Sears’ costs as reported by Arkansas Business. SCM processes go beyond technology. Wal-Mart’s sprawling 120 million square foot network has 160 distribution centers located within 130 miles of their designated stores according to MWPVL International supply chain and logistics consultants. Around 81% of Wal-Mart® merchandise was processed via the centers in 2013 and their implementation of cross-docking whereby arriving truck inventory is shifted directly to departing trucks which skips lengthy transits, warehouse storage times and lowers inventory storage and transportation costs. TruckersLogic also points out that the personal Wal-Mart® trucking fleet and drivers are kept to high standards of 250,000 miles road time entirely free of preventable accidents for three years minimum for their thousands of drivers. Wal-Mart’s overall methods and main components line up with most supply chains like purchasing, operations, distribution, and integration. But the retailer has refined all SCM methods. For Wal-Mart, its SCM methods consistently yield reduced expenses of units and stock as well as improved store selection controls and better buyer pricing per TradeGecko. Disclaimer: This research was completed for the University of San Francisco Online. All names, logos or trademarks belong to their respective trademark owners who are not affiliated with or endorse or sponsor the online university and its programs or materials.